Creatures in the mollusc family, both land and sea. 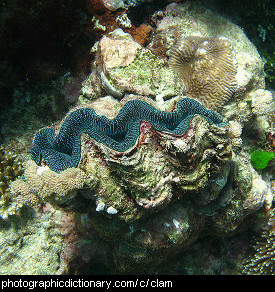 A clam is related to the snail. 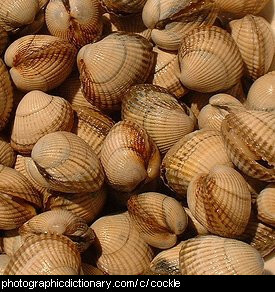 Clams have shells in two halves with a hinge joining the halves. Clams don't have eyes or brains. Cockles are related to clams, mussels and snails. They have a shell in two parts joined by a hinge. Cockles burrow into sandy beaches and eat tiny creatures in the water that washes over them. Cockles can be caught and eaten. 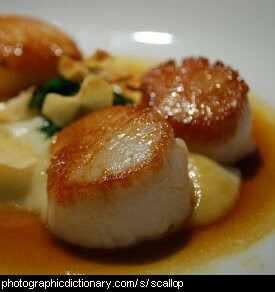 They are cooked in much the same way as other similar creatures like mussels. 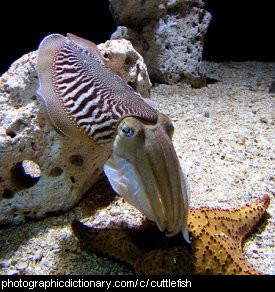 Cuttlefish are not fish, but are a type of mollusc related to squid and octopi. Cuttlefish have three hearts, blue-green blood and a single bone inside them. You often see cuttle bones being given to budgerigars. They can change colour to camouflage with the environment around them. Cuttlefish are caught as food and prepared in a similar way to squid. 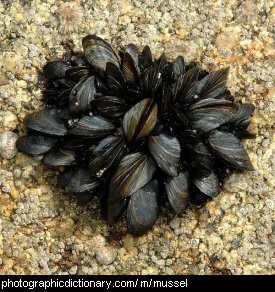 Mussel is the common name given to a type of long, thin, black clam that is found stuck to rocks in the tidal zone of coastlines. Mussels are collected for food, and can be prepared in a huge number of different ways. 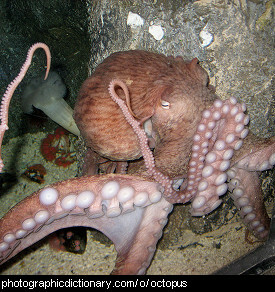 An octopus is a creature with eight arms that lives in the sea. The bottom of their arms is covered in suction cups. Most octopi have no bones, so they can squeeze into very small holes to hide. Octopi have three hearts and blue blood. Octopi are distantly related to snails. 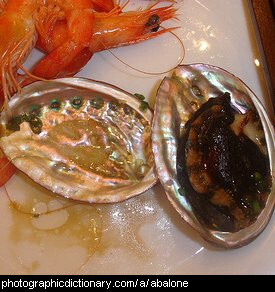 Oysters are a kind of mollusc that lives in the sea or salty water. Their shell is in two halves like a clam shell, and the oyster can pull it closed. 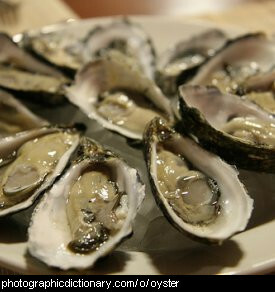 Oysters eat by filtering food from the water that flows over its shell. They live their adult lives stuck to rocks - a young oyster that has just stuck to a rock is called a spat. Oysters have been eaten for thousands of years. They can be eaten raw, cooked, smoked or as part of another dish like soup. 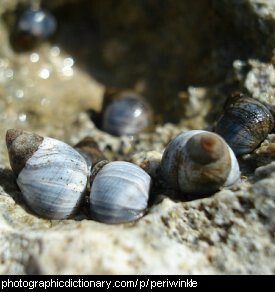 Periwinkles are a type of edible sea snail. They are found in the shallow water on rocky beaches all over the world. Slugs can be found on land and in the water, both freshwater and the sea. They are very similar to snails but slugs don't have a shell, and in fact any land mollusc without a shell can be called a slug. 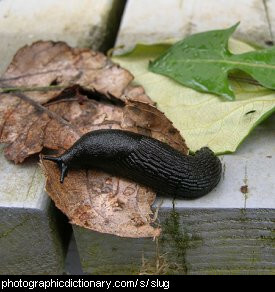 Since they have nowhere to hide inside and can dry out, slugs usually live in moist or wet places.